This USB3 Vision camera features the CMOSIS CMV4000 sensor to deliver 2048 x 2048 resolution at 74 frames per second. 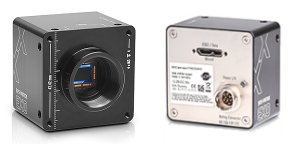 SVS-Vistek calls their EXO series cameras “the integrator’s camera,” and they do so with good reason. These cameras deliver all the imaging control you would expect, plus a surprising amount of I/O functionality. Being Genicam compliant, most machine vision software platforms can easily communicate with EXO cameras. And, for those that prefer to develop a custom application, there is a free SDK.